These immortal words come to you, not from Ernest Hemingway, but from Mike Ditka on today’s Sunday NFL Countdown. And while a person being partly truth and partly fiction is hardly a contradiction (just like a salad being partly lettuce and partly chicken isn’t), the idea of a dichotomy between fiction and truth is very common. Fiction is something that’s made up. It’s invented, imagined. According to the dictionary, truth is something that conforms to reality. Isn’t it possible for something to be made up and conform to reality? These things aren’t mutually exclusive, but the way we think of them as being so leads to some thought traps. Stories seem to matter more if they’ve actually happened because we know that any theme or moral has arisen incidentally and naturally from the story. There was no motive behind it. However, if we take the exact same theme and construct a fictional story around it, if feels less genuine, as if the story is just serving an end. It doesn’t matter to us that the theme is the same—its validity somehow depends on its context more than itself. Tim O’Brien does a great job describing “true stories that never happened” in his novel The Things They Carried. The basic idea is that a made-up story can be “truer” than one that actually happened if its theme conforms more faithfully to reality. I’ve written in the past about the validity of dreams using much of the same logic. It’s like if we have a fictional story that vaguely tells us the sky is blue and cloudy and a factual one that tells us it’s filled with twinkling green and purple lights. Yes, the Aurora Borealis happens, but our “fictional” account of the sky does a better job describing everyday life. It’s truer, even though it didn’t actually happen. So yes, Mike Ditka, we’re partly truth and partly fiction. But the sizeable overlap is the interesting part. There’s something about libraries that astounds me. I recently began working at the theology library at SMU and it’s kind of a humbling experience. In a library, especially in a library like Bridwell, it’s like being enveloped in what you aspire to be. Today at work I wandered through the stacks past the Doctorate of Ministry theses and it was unreal. People in my field, doing what I want to do, putting their thoughts, their ideas, their dreams to paper and having those ideas saved for the future generations. I kept wandering through the stacks, venturing up and down the aisles looking at all the knowledge stored withing the volumes and it was continually amazing. What wonders were in each of these books? I wanted to sit down and read them all, but I 1) had to get back the work and 2) the time it would take to read the millions of books would be insane. I was literally surrounded by knowledge, by true Theology, logos about theos. It put into perspective how little I know and how much I have to learn. We live in a world where you can hold thousands of books in the palm of your hand on a Kindle or a like device. It’s the future! But even with this technology I find myself more in awe of the library. It may be because I’m the kind of person that likes to have physical media. I’m probably one of the few people in my circle of friends that still pays for music much less buys physical albums. Or it may be that being in a place where everywhere you turn you can see a tangible representation of a new idea or a new way of thinking sparks a new process in my brain, a desire to create and contribute. If you get the chance, walk into a library sometime soon. Not because you have to get a book for a class or for any particular purpose. Just explore for a while. Take the time to get lost in other people’s ideas. But after that, come out of that cocoon of books and start to work out what your contribution to the world of ideas will be. We may not all be authors, but we all have something we think about that’s worth sharing. You should read this book to feel like more of a person. 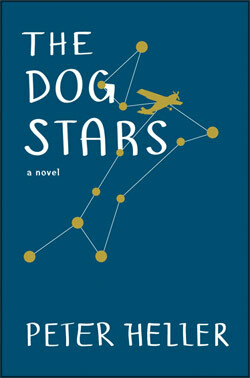 As a person who is quite weary of post-apocalyptic/dystopian portrayals and was never a huge fan of them to begin with, I can say decisively that Peter Heller’s novel The Dog Stars is my favorite offering from the genre. This is one of those rare books that makes you feel a little bit more human. The novel’s narrator and protagonist, Hig, has “an extraordinary gift for hope” (Gatsby reference, for those interested) that gives the whole affair a rather different tone than something like 1984 or The Road; Hig is endearingly childlike and atypically loving in a world where survival is the highest virtue. The central question of the book, in Hig’s words, is this: “Is it possible to love so desperately that life is unbearable?” (Page 55). The narrative poetically explores the connections between loss, love, humanity in a way that’s compellingly original (and considering the topics, that’s no easy task). I don’t want to give much of the book away, because everyone should read it, so here are a couple points for thought either while reading or just while living normally. Why does loss define us in ways “having” cannot? We all heard the idiom as kids: ‘you don’t know the worth of water until the well runs dry.’ To some extent, this is untrue, but the idea is that a dry well can define your being more powerfully than a wet one, precisely because you always knew the worth of water and could see a future in which you wouldn’t have it. And now that the future has arrived, it hurts just as much as you expected, but that doesn’t help ease the pain. Hig’s response to loss is largely this irrational hope that goodness is still out there somewhere; in him, in other people, in the world. Everything he’s lost is so valuable to him that all he can do is remember it passionately and hope for its resurgence. What are the things that are most vital to us? Which are the pieces that give us texture? And how do those pieces shape our interaction with the world? In short, what makes us human? Hig treasures the small hours he spends fishing with his dog and the lightness and detachment he feels flying recon over a broken world. These things are incredibly important to the book in the way that our own versions of fishing and flying are incredibly important to our identities. These things make Hig feel like he’s finally awake after years of a nightmarish existence killing to avoid dying. And that’s one of the biggest ways the book addresses the question of humanity: why does Hig want to stay alive? He’s lost everything he cares about; he laments that even the trout have died off and carp just aren’t the same. Look for this in the book. When does Hig most desperately want to live, and when does he proclaim to not care if he dies? What determines his attitude? Last selling point—the book does a phenomenal job using first-person. It has some stream-of-consciousness elements, but mostly it paints a deep picture of a person who ultimately isn’t so unlike his readers. I’d rank The Dog Stars second in terms of quality-drop-off-if-it-had-been-third-person, behind only The Catcher in the Rye. So read this. If you do, disappointment is not in the stars. It recently occurred to me that I haven’t had a night-light in a while. This may seem an underwhelming epiphany, but I remember thinking as a second grader that not having a night-light represented a significant tipping point in life. Once I no longer needed that viridescent glow, then, surely, I was an adult. That was the signal that I could start calling everyone by their first names and stay up as late as I wanted watching basketball. And once I made this realization, I started missing something I’d forgotten I had ever needed. That fuzzy green beacon had warded off more bed-dwelling monsters than I could count, and I’d barely remembered its loyal service. It felt disrespectful. It also felt like I was slightly less of myself for having abandoned an integral part of my childhood memory. I’m a little sad that I no longer need to cling to that resolute light: It’s like the bell from the polar express has gone silent, only the bell is a two-dollar aquamarine LED and it symbolizes simplicity and imagination instead of love. Really, the point of writing this is to mourn the loss of my night-light and anything anyone has ever lost in the process of growing up. These things helped make us who we are even as we confined them to the past. We might as well do them the service of remembering. Here’s another John Green book-sparked topic. As always, it works better if you’ve read the book, but this one will still make some sense even if you haven’t. Mild spoilers, though. If we haven’t really blasted this fact home, we here at Irrational Confidence love us some John Green. I recently finished Paper Towns and just like when I finished the equally amazing Looking for Alaska I feel an incredible need to write something about it. First of all, if you haven’t read Paper Towns, go read Paper Towns. I’m delving into some late game themes and I don’t want this book to be ruined for you. It’s well worth the read, trust me. What really stuck out to me was how much this book impacted me BECAUSE I had read Looking for Alaska. When I first met Margo Roth Spiegelman, I thought that Green had merely written himself a copy of Alaska Young, almost like he felt a need to revisit such a compelling character to make up for her story’s end. As the book progressed, it came to be clear that while Green had not done this, the fact that I thought this to begin with brought weight to all of Q’s discoveries. I had projected a character onto Margo. She had become a mirror to me. Like Q, I saw her as a character (look over the fact that she was one in the literal sense) and not a person on her own. By leaving Alaska behind and allowing Margo to be Margo, her character and her motivations became so much more gripping. The crux of the book is finding out how to view other people. Margo calls Orlando a paper town. It’s something that has been constructed flimsily and has no substance. It is easily put aside, it’s full of shallow people. Margo herself comes to think of herself as a paper girl. She is someone who everyone projects themselves onto. Everyone she interacts with is only seeing themselves, not Margo. She is not allowed to have her own identity and that is what eventually drives her escape to an actual paper town, Agloe, New York. Q never notices Margo as a girl until well into his quest to “save” her. He realizes that he’s in love with an idea, of a figment that he’s created. It’s why his reunion with Margo is so tense when he first arrives. Q falls into this trap with his friend Ben as well. He expects Ben to be Q instead of allowing Ben to be himself. It takes a tongue lashing from his friend Radar (Green admitted to naming the character this because he always had the best sense of where people are at. I’m telling you, John Green is awesome) for Q to realize not only what he’s done to Ben but what he’s done to Margo. He makes people into mirrors, rather than looking through windows. I find myself making mirrors more often than not. I would always tell my youth kids in jest, if they felt like confessing something they had done, “Don’t tell me that! I want to keep pretending you’re perfect.” I was putting my own pressures onto them. The way we see each other and the way we imagine ourselves becomes one and the same. When people disappoint us, it’s because they didn’t behave in the way we would have. We make our friends and neighbors into characters, into paper people whose stories we write ourselves. We, like Q and his friends on their road trip, make narratives for the people we encounter and then lash out when the actual person doesn’t fit the scene we placed them in. The quote that became the title of this post is the truth of the matter. Q could only see Margo for what she was when he began to embrace her cracks. Green describes life as a vessel, that time and events and experiences put cracks in the vessel and eventually it can’t hold up anymore. We all have cracks. We can pretend that the people we interact with are perfect, that they’re flawless, but when we do that we make them into paper people. We make them into characters. The truth of life is that we have to allow people to be who they really are and love them anyway. We will see them almost perfectly in the cracked darkness. When I worried about anything as a kid, my parents told me that everything would be all right. They told me that it was their job, as parents, as adults, to worry about such things so that kids like me didn’t have to. A noble burden, to be sure. Eventually, because I was not expected or encouraged to worry, I actually did curtail my concerns. And by the time I was supposed to start becoming an adult, to start agonizing about those things again, I had realized that I liked not doing so. And it’s not like I thought anything was going to go wrong if I didn’t start worrying again: things had been fine so far, I’d been protected, I’d been reassured of my safety. Inescapable habit and unspoken complacency caught my body coming through the rye. And the bodies of much of my generation. I worry that we’re worse at becoming adults than the not-adults of generations past. It may be the shortsightedness that comes with being involved in anything, but I think the everyone-gets-a-trophy mentality might have ‘worked.’ We dangerously believe that everything will turn out all right regardless of what we do. We have the optimism of brick without the steady hands of a mason to warrant it. Our innocence has been protected on a deeper level than rap lyrics would have you suspect. Reality will eventually dictate that someone has to be responsible, and I’m cautiously hopeful that someone will be. I think this generation still has the capacity to correctly, naturally, gracefully lose our innocence like every generation before us, and the capacity to use that loss to create our future. Impose on chaotic what seems so serene. You may as well swim in the sky.